If you have turned the breakers off and back on, and have verified 120VAC present I would start replacing those cheezy push on rwceptacles with real household ones. Get your VOM out, prove 120vac on the output side of the breakers. Then start taking the receptacles out one at a time and prove 120VAC at the wires. I did replace the one for the frig with a household one. The one that was there was a push on wires plug. As I said after that I have at least 6 plugs now that wont work including one that I used with an extention cord outside next to the frig to make the frig work. Most of the plugs that arent working are in the kitchen near the frig. Sounds like I have the whole circuit out. My circuit breaker in the back of the Rv none of them are tripped.. I too suspect a tripped GFCI. Just checked and there are 6 outlets in the living area including kitchen with refrig and microwave. 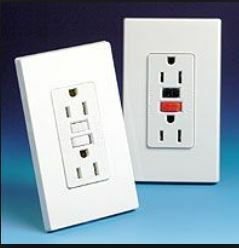 One outlet with a gfci. The gfci is not flipped. Strange thing is the microwave outlet in cupboard next to frig is OK as all the 2 outlets in the back area including bathroom and bedroom. One of those is a Gfci outlet. All 5 are not working in living area except as I said the microwave outlet in cupboard next to frig. Maybe Im not connecting wires on the new plug for refrig right... As I said i have 2 power cords connected. So what i did is use a new house hold plug and put the power cords white wire to top where it said white wire and then i took the black wire and put it on the other side on top. I then took the other power wire and did the same thing keeping both white wires on the same side and also the black wires on the opposite side.. I wrapped the copper ground over the other and attached it to the green screw on the plug. Do you have an inverter? If so there may be a breaker on it serving some plugs. Considering that the breakers themselves are 24 years old, check those as well. They don't last forever.